Conor Walton’s still lifes of milk jugs, biscuits and bread are remarkably detailed and reassuringly timeless, painted in a classic style that borders on photorealist. After graduating from the National College of Art and Design in 1993, Walton trained in Florence under an Italian Renaissance model that requires students to master traditional drawing and painting techniques before embarking on experimentation. Walton paints portraits, landscapes and various types of still life, including vanitas works. The works here are small, solid, skilled paintings with a homely feel, depicting a single chocolate sweet in a golden wrapper, or a glass of wine. He is particularly accomplished at catching the mottled surface of pear skins or the bloom on a bunch of grapes. Each food object is set in clean space against a plain backdrop. 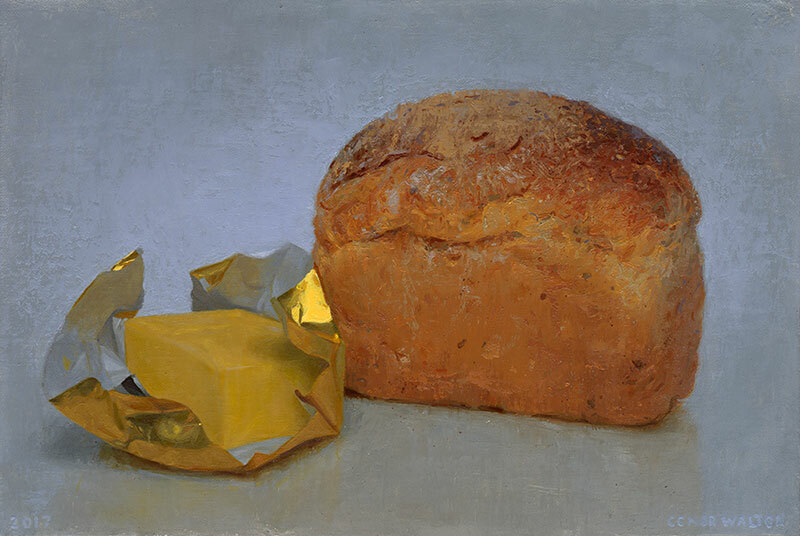 Occasionally, as in Cake and Brown Bread, there’s a reflective surface beneath, on which Walton can further demonstrate his realist painting skills. This is about painting as a pure pursuit, and a concentrated depiction of everyday domestic objects. It’s a back-to-basics kind of show, refreshing in its simplicity, if also a little empty for it.